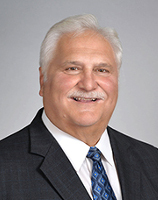 Michael Sampone joined Pyramid Brokerage Company’s Albany Office in 2004 after retirement from the New York State Department of Taxation and Finance, serving in numerous executive positions. He has also served in various capacities for the Fulton Montgomery Community College Foundation and Board of Trustees, Montgomery County IDA, Montgomery County Ethics Commission and Greater Amsterdam School District Budget & Redistricting Committee. Michael’s primary focus is in Industrial leasing and sales. To date he has completed more than 40 transactions with a leasing/sales volume of over $13,000,000. Some of Mike’s notable clients include: SLA Transportation, Konica Minolta, Miami Corp and STAG Industrial.